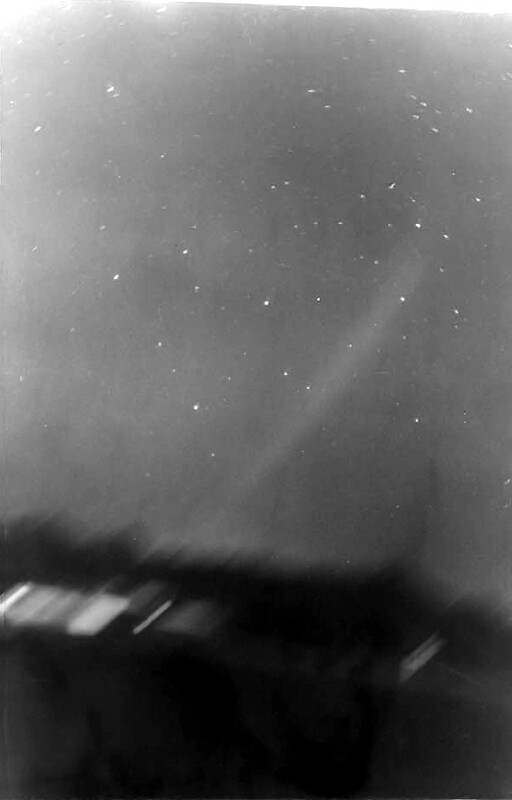 Comet Ikeya-Seki rising in the morning sky on 1965 November 4 around 4:30 a.m. (haze is obscuring the comet's head). 10-minute exposure on Tri-X film. Photo by Bill Jenkins. See the source document for an annotated version that identifies various stars in the field. Wide angle of lens caused stars to arc over comet's tail. Head was just visible at horizon till haze obscured it visually, although still visible in telescope. This photo is from the RASC Comet and Nova Section Archive. Processing (including noise reduction) by WM.